The Official NCAA® Ticket Exchange includes resale tickets -- prices may be above or below face value. Experience the College World Series in Omaha with PRIMESPORT, the Official Ticket & Hospitality Provider of the NCAA. Be there live for the 2019 NCAA Men's College World Series beginning June 15 and for the best-of-three championship series starting June 24. 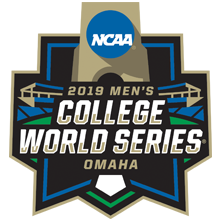 SEE FULL DETAILS > Buy and sell NCAA Men's College World Series tickets on the Official NCAA Men's College World Series Ticket Exchange powered by PRIMESPORT. Sellers never have to worry about getting paid and buyers can rest assured that all tickets are 100% authentic and guaranteed! Elevate your game day at TD Ameritrade Park with an NCAA experience like no other! As every true fan knows, game day is about more than just the game...it's also about the pregame! Get ready for all the action on the diamond at the Official NCAA Experience, located in Fan Fest adjacent to the park. Escape the heat before Game 1 in this exclusive, air-conditioned tented lounge where guests will enjoy a delicious tailgate meal with refreshing soft drinks, snacks, live TV broadcast, indoor games and a cash bar for ice-cold beer! The Official NCAA Experience is open two (2) hours prior to start of Game 1 and closes at game time. Escape the heat before Game 2 in this exclusive, air-conditioned tented lounge where guests will enjoy a delicious tailgate meal with refreshing soft drinks, snacks, live TV broadcast, indoor games and a cash bar for ice-cold beer! The Official NCAA Experience is open two (2) hours prior to start of Game 2 and closes at game time. Escape the heat before Game 3 in this exclusive, air-conditioned tented lounge where guests will enjoy a delicious tailgate meal with refreshing soft drinks, snacks, live TV broadcast, indoor games and a cash bar for ice-cold beer! The Official NCAA Experience is open two (2) hours prior to start of Game 3 and closes at game time. Escape the heat before Game 4 in this exclusive, air-conditioned tented lounge where guests will enjoy a delicious tailgate meal with refreshing soft drinks, snacks, live TV broadcast, indoor games and a cash bar for ice-cold beer! The Official NCAA Experience is open two (2) hours prior to start of Game 4 and closes at game time. Escape the heat before Game 5 in this exclusive, air-conditioned tented lounge where guests will enjoy a delicious tailgate meal with refreshing soft drinks, snacks, live TV broadcast, indoor games and a cash bar for ice-cold beer! The Official NCAA Experience is open two (2) hours prior to start of Game 5 and closes at game time. Escape the heat before Game 6 in this exclusive, air-conditioned tented lounge where guests will enjoy a delicious tailgate meal with refreshing soft drinks, snacks, live TV broadcast, indoor games and a cash bar for ice-cold beer! The Official NCAA Experience is open two (2) hours prior to start of Game 6 and closes at game time. Escape the heat before Game 7 in this exclusive, air-conditioned tented lounge where guests will enjoy a delicious tailgate meal with refreshing soft drinks, snacks, live TV broadcast, indoor games and a cash bar for ice-cold beer! The Official NCAA Experience is open two (2) hours prior to start of Game 7 and closes at game time. Escape the heat before Game 8 in this exclusive, air-conditioned tented lounge where guests will enjoy a delicious tailgate meal with refreshing soft drinks, snacks, live TV broadcast, indoor games and a cash bar for ice-cold beer! The Official NCAA Experience is open two (2) hours prior to start of Game 8 and closes at game time. Escape the heat before Game 9 in this exclusive, air-conditioned tented lounge where guests will enjoy a delicious tailgate meal with refreshing soft drinks, snacks, live TV broadcast, indoor games and a cash bar for ice-cold beer! The Official NCAA Experience is open two (2) hours prior to start of Game 9 and closes at game time. Escape the heat before Game 10 in this exclusive, air-conditioned tented lounge where guests will enjoy a delicious tailgate meal with refreshing soft drinks, snacks, live TV broadcast, indoor games and a cash bar for ice-cold beer! The Official NCAA Experience is open two (2) hours prior to start of Game 10 and closes at game time. Escape the heat before Game 11 in this exclusive, air-conditioned tented lounge where guests will enjoy a delicious tailgate meal with refreshing soft drinks, snacks, live TV broadcast, indoor games and a cash bar for ice-cold beer! The Official NCAA Experience is open two (2) hours prior to start of Game 11 and closes at game time. Escape the heat before Game 12 in this exclusive, air-conditioned tented lounge where guests will enjoy a delicious tailgate meal with refreshing soft drinks, snacks, live TV broadcast, indoor games and a cash bar for ice-cold beer! The Official NCAA Experience is open two (2) hours prior to start of Game 12 and closes at game time. Escape the heat before Championship Series Game 1 in this exclusive, air-conditioned tented lounge where guests will enjoy a delicious tailgate meal with refreshing soft drinks, snacks, live TV broadcast, indoor games and a cash bar for ice-cold beer! The Official NCAA Experience is open two (2) hours prior to start of Championship Series Game 1 and closes at game time. Escape the heat before Championship Series Game 2 in this exclusive, air-conditioned tented lounge where guests will enjoy a delicious tailgate meal with refreshing soft drinks, snacks, live TV broadcast, indoor games and a cash bar for ice-cold beer! The Official NCAA Experience is open two (2) hours prior to start of Championship Series Game 2 and closes at game time. Want the latest championship ticket info? The Official NCAA Experience helps get you ready for all the action. Guests will enjoy a pregame meal/light hors d'oeuvres, limited open bar/cash bar, entertainment and more! Buy or sell tickets to select NCAA Championship events on the Official NCAA Ticket Exchange, the only 100% guaranteed, NCAA-approved, secondary ticket marketplace. Escape the heat before each game in this exclusive, air-conditioned tented lounge where guests will enjoy a delicious tailgate meal with refreshing soft drinks, snacks, live TV broadcast, indoor games and a cash bar for ice-cold beer! We’ve got great tickets to one of the most sought-after championships on the NCAA calendar. Not only that, but your College World Series ticket package will also include the NCAA’s official hospitality – the NCAA Fan Experience. Within this air-conditioned, tented lounge, fans at the NCAA Fan Experience enjoy the live TV broadcast, with games and lawn seating. The hospitality tent will be open prior to each game and between games. A tailgate meal, soft drinks and cash bar with ice-cold beer will be available. When it comes to marquee events, tickets are just the beginning. Prove your fandom by taking your experience to the next level with a 2019 College World Series travel package from PRIMESPORT. College World Series Travel Packages are available for opening weekend as well as the championship series. In either case, you’ll get great hotel accommodations, wonderful CWS tickets, access to hospitality, souvenirs and a lot more. Don’t miss your chance to experience the College World Series like you’ve never imagined before with PRIMESPORT. You can purchase your 2019 College World Series tickets directly on primesport.com, the Official NCAA Ticket Exchange. PRIMESPORT is the only NCAA-approved, secondary marketplace that allows fans to buy and sell College World Series tickets safely with other fans. All tickets are authentic and 100% guaranteed. We have College World Series tickets available to all games, including the CWS Finals. Be there live June 27 for game 1 of the College World Series Finals. Already have tickets but can no longer attend? If you need to sell tickets, you can do it here. Sign up for a PRIMESPORT account and take advantage of our guaranteed seller reputation and the Official NCAA Ticket Exchange. The College World Series was first contested in Kalamazoo, Michigan in 1947. The College World Series returned to Kalamazoo in 1948 and was played in Wichita, Kansas in 1949. In 1950 the College World Series moved to Omaha, Nebraska and has been played there every year since. From 1950 to 2010, the games were held at the iconic Rosenblatt Stadium but have since been move to TD Ameritrade Park. The most highly attended College World Series was the 2003 matchup between Texas and Miami which saw 26,000 fans in attendance. Texas has more CWS wins than any other team with 85, but falls second to Southern California in CWS Finals wins. USC has 12 national titles in 35 appearances, the most in both categories. Each College World Series is contested between the 8 teams that advance from super-regionals and is held in a double elimination format. The College World Series Finals is a best of 3 series contested between the last two teams standing. The NCAA College World Series began in 1947. The original format featured a eight-team, single elimination bracket. Today's College World Series format starts with 64 teams playing in a regional, super regional format. Eight super regional champions advancing to Omaha into two, four-team, double-elimination brackets. USC has the most College World Series titles with 12. The '14 and '15 championship series featured the same two teams – Virginia and Vanderbilt. Vanderbilt won the title in '14 with Virginia winning it all in '15. Last year, Coastal Carolina won the championship for the first time in school history. TD Ameritrade Park replaced Rosenblatt Stadium as the home of the College World Series in '11. The park holds 24,000 fans and set attendance records for the College World Series in '11 and in '13. Outside of the College World Series, TD Ameritrade Park serves as the home field of the Creighton Blue Jays baseball team.